Semináře a konference pro učitele angličtiny. S nakladatelstvím Macmillan se můžete setkat na těchto akcích. Seznam průběžně doplňujeme. Pořádáte akci pro angličtináře? Dejte nám prosím vědět. Informace zde rádi zveřejníme. Zveme vás na naši ELT Ideas konferenci, na Žilinskou univerzitu. 15. konference se uskuteční v sobotu, 27. dubna 2019. 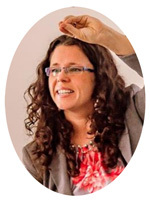 Daniela Clarke has been involved in ELT since 1997, mainly in the UK as a teacher, teacher trainer and subject learning coach. Her teaching experience ranges from young learners to adults of all language levels and competencies, and her teacher training experience covers training on the Trinity Cert TESOL and Exam Assessors Courses. Daniela currently works as a teacher trainer and ELT consultant. In this workshop we will look at a variety of activities for young learners which help hold their attention through a blend of play, moving around, creating etc. The activities demonstrated in the workshop not only expose young learners to the target language in relevant ways, but also help them acquire effective learning strategies and develop their thinking skills.